The Nokia 808 PureView has an expectedly impressive set of connectivity options. Starting off with the basics, you get a true worldwide-ready phone: quad-band GSM/GPRS/EDGE and penta-band 3G with HSDPA (14.4Mbps) and HSUPA (5.76Mbps). Wherever there's a GSM network you'd get voice calls and data, which is anything but sluggish. Local connectivity is well covered too. You get Wi-Fi b/g/n with DLNA and Wi-Fi tethering thanks to the JoikuSpot app. Bluetooth 3.0 is on board with A2DP stereo, but unfortunately lacks an HS profile. There's USB with On-The-Go support for wired connectivity, which worked with everything we threw at it, except USB hubs. NFC is increasingly popular of late and the PureView supports it. Pairing is as simple as you could possibly imagine, just put two NFC-enabled gadgets (usually, two smartphones) together and they will connect. Hooray, no more PIN codes! Sending stuff works the same way - select the files you want to send (one or many) and tap the two phones together. They'll handle the rest, including switching on the Bluetooth receiver. Finally, there's the microHDMI port that can output 1080p video with multi-channel audio (as long as the video source has that). Keep in mind you'll need to purchase an HDMI cable as there's isn't one in the retail package. On the surface, the Feature Pack 1 browser hasn't seen much change. Underneath, however, Nokia has done a great job at expanding the HTML5 support and making pages load even faster. On top you have the URL bar, which auto-hides ones the page loads. Once you start typing a "Search for..." pop-up lets you choose one of several search engines (Google and Bing are offered in most locations). At the bottom, you have a fixed row with five shortcuts - Back, Forward, Bookmarks, Tabs and Menu. The addition of the Tabs shortcut makes managing multiple pages easier - in earlier versions you had to go through the popup menu, involving a few extra clicks. The browser supports FlashLight 4. It felt fluid and fast when we panned around a page and zoomed in and out. We didn't really see any pages break in the browser either. Nokia has definitely brought up its browser a huge step forward thanks to the updated browser engine. 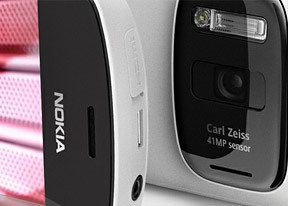 Symbian has a solid track record in the PIM department and the Nokia 808 PureView with Nokia Belle is no exception. Nokia has just tweaked a thing or two. The calendar has three different view modes - monthly, daily and a to-do list, which allows you to check all your To-Do entries regardless of their date. There are three types of events available for setting up - Meeting, Anniversary and To-do. Each event has some specific fields of its own, and some of them allow an alarm to be set. You can sync the phone's calendar with multiple online accounts and each gets its own color so that they're easy to tell apart. The Nokia 808 PureView has multiple ways to deal with office documents. Quickoffice comes preloaded, as does the Offline Office from Microsoft. The Adobe PDF reader is also here to take care of those .PDF files. Unfortunately, the preinstalled Quickoffice version doesn't support editing, but don't fret, as Microsoft's own Office app doesn't have such limitations and is already available for Symbian free of charge. The organizer package also includes a dictionary, a voice recorder, as well as the Notes application. The good unit converter we've come to know from Symbian^1 is strangely gone but you can grab one yourselves at the Nokia store for free. The alarm application can juggle as many alarms as you want, each with its own name, start and repeat time. As we already mentioned, thanks to the built-in accelerometer you can also snooze the alarm by simply flipping your phone over.